It’s a dark time for fans of Dark Matter. Deadline reports Syfy has cancelled the TV show after three seasons. The sci-fi drama follows the crew of a derelict spaceship who awake with no memory and who must work together to survive a threatening voyage charged with vengeance, betrayal, and plenty of secrets. The cast includes Marc Bendavid, Melissa O’Neil, Anthony Lemke, Alex Mallari Jr, Jodelle Ferland, Roger Cross, and Zoie Palmer. Ratings for Dark Matter have been low for some time. Overall, season three averaged a .15 rating in the 18-49 demo and only 614,000 viewers, making it one of Syfy‘s lower-rated TV shows for the 2016-2017 season. What do you think? Are you a fan of Dark Matter? Do you think Syfy should’ve renewed the series? I’m pretty much heart broken to find out the series was canceled, this was probably the best show I’ve ever seen in my life, I’m even thinking about in my later future if I could get a lot of money and try to get it continued somehow, like being a big funder. managed to divest themselves of 3 of the best shows on television. As far as I’m concerned, for Syfy, … it’s ByBy! 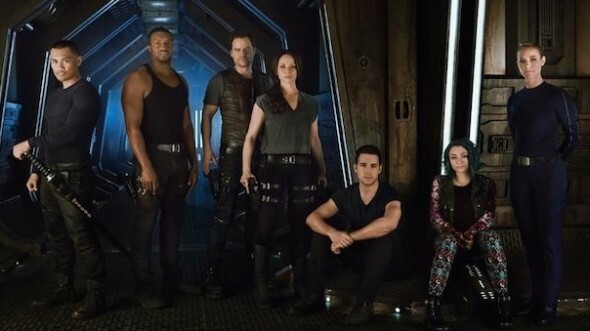 Dark Matter was one of the best shows on any network and was the best show on SyFy (tied with Expanse for best show, IMO). It is unbelievable to me that they have canceled it. This was a great show with excellent writers. The show got low ratings because SyFy did a terrible job of promoting it. Every time, except one, I’d ask someone if they liked the show, they said they never heard it. The one person who did know the show loved it. Hi to all “Dark Matter” fans, would a email from us all to the “execs” at Sifi headquarters do the trick letting them know “We are not happy “ with their decisions and keep repeating it every week till they get it!!! Just a thought! Damn sad, I am rewatching it 3rd time and would say this show is or was on my top 10 list. Syfy did it again. I’m very disappointed they cancelled Dark Matter when they kept shows that are far inferior!. My TV producer friend told about Dark Matter because the acting and writing was great. Why would anyone cancel a show when it has such great ratings. SYFY deserves to fail as you don’t know when you have a great product! Stupid is …Stupid does!!! Perhaps they can end it with a movie like they did with Firefly. I enjoyed Dark Matter and Killjoys. I looked forward to them every summer. I watched the premieres of Wynona Earp and Killjoys tonight and am sad Dark Matter won’t be joining them. I cannot believe they cancelled Dark Matter when they kept Wyonna Earp. My husband and I looked forward each week to Dark Matter because the acting was brilliant. Who are these mindless people tat cancel shows especially when they had such great ratings. Must be the same idiotstat work for CBS. Well SYFY I hope all your new shows this year fail because you are flunkys. I am still in disbelief.